Richard Hamilton, Solomon R. Guggenheim, 1967. Oil on photograph, sheet: 7 1/2 × 7 1/4 inches (19.1 × 18.4 cm). Solomon R. Guggenheim Museum, New York, 67.1858. © 2014 Artists Rights Society (ARS), New York / DACS, London. Excerpt of biography (courtesy the Guggenheim Online Collection: Often identified as the founder of Pop art, Hamilton first garnered recognition for his work during the 1956 exhibition This is Tomorrow, organized by the Independent Group at the Whitechapel Art Gallery, London. Just What Is It That Makes Today’s Homes So Different, So Appealing? (1956), a collage comprised of modernist iconography culled from mass-circulation magazines and referred to as the very first work of Pop art, visualizes comfortable, modern living but with an ironic overtone. 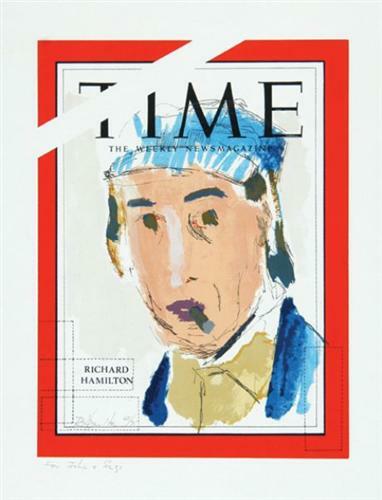 Hamilton’s enthrallment with American consumer culture, mass-production techniques, and contemporary mechanical processes manifested heavily within his practice, as did his veneration for the work of Marcel Duchamp…. Richard Hamilton, Self Portrait 67, 1967.